Richard E Grant may be one of Britain's big hopes at this year's Oscars - but his role almost went to someone else. 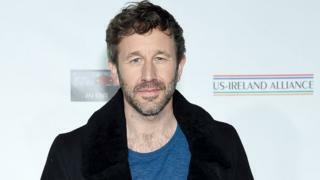 Irish actor Chris O'Dowd was originally cast in Can You Ever Forgive Me? - one of the most prominent films in this year's awards season. But the role eventually went to Grant, whose performance scored him both critical acclaim and an Oscar nomination for best supporting actor. "What a heartbreak," O'Dowd tells BBC News at the Oscar Wilde Awards. "We were ready to go, it was myself and Julianne Moore, and we had moved to New York, and maybe two days before we started filming, there was some creative differences that I wasn't really involved in." Image caption Richard E Grant and Melissa McCarthy are both nominated for Can You Ever Forgive Me? Those creative differences also saw the project lose its original director, before Marielle Heller took over. 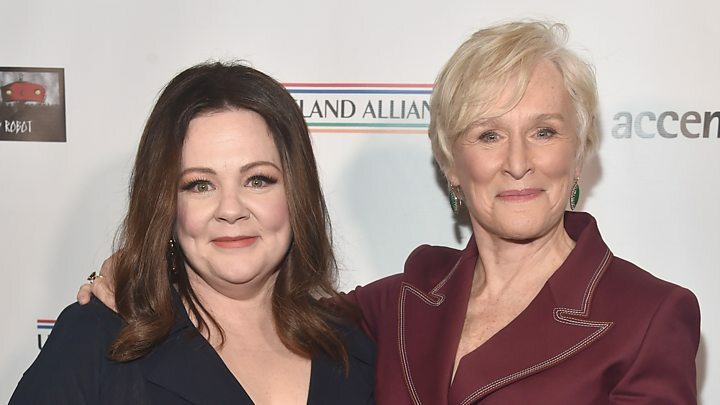 Meanwhile, Melissa McCarthy replaced Moore, and is also in the running for an Oscar. "I was surprised, that the film wasn't going ahead at the last minute," says O'Dowd. "But Richard's performance in it is so wonderful, that it feels like it was kind of meant to be." Which is a diplomatic way to look at it, but surely it's gutting when you see someone else having such success with a job that was originally yours? "Totally!" laughs O'Dowd. "I know Richard a bit, we've worked together, and watching him go on this journey through the Oscars has been so intoxicating. "But definitely I would've preferred if it was me!" O'Dowd, who now lives in Los Angeles, has starred in films such as Bridesmaids, The Sapphires and Juliet, Naked - the new adaptation of the Nick Hornby novel of the same name. He was honoured at Thursday night's Oscar Wilde Awards - dubbed the Irish Oscars - one of the many ceremonies taking place in the days running up to Sunday's Academy Awards. The Oscar Wildes are intended to champion relations between the US and Ireland, and the ceremony is hosted by JJ Abrams at his Bad Robot studios in Santa Monica. Abrams appeared at the party less than a week after completing filming for Star Wars: Episode IX, which is released this December, four years on from his last movie in the series. "It's a far bigger movie [than The Force Awakens] in every way, so it was a much bigger challenge," the director says of the film, which coincidentally also stars Richard E Grant. "Richard was someone who I met when I was in my 20s, I've been a fan of his for a long time, I'm so thrilled we finally got the chance to work together, and he was incredible. "I can't wait for you to see him in this. Obviously he's got a nomination on Sunday, a very deserving nomination, I love the man." One of this year's Oscar nominees who is considered a dead cert to win is Glenn Close, who is nominated for best actress for her role in The Wife. Lady Gaga and Olivia Colman were the favourites in that category at the beginning of awards season, but momentum turned in Close's favour after a win at the Golden Globes in January. "You know the only pressure I feel is I've gotten so much incredible love from people, and I feel like a lot of people are rooting for me," Close tells BBC News. "And the pressure I feel is that I don't want to let them down. But personally, I'm OK."
Close currently is the actress with the most Oscar nominations to her name without a win. "If I lose," she laughs, "I'll still have that record." The actress's first nomination was in 1982, when she received a best supporting actress nod for The World According to Garp. "I remember when hearing about [the nomination], it was in the basement of the home where we were filming The Big Chill," she recalls. "And somebody told me I was nominated for an Oscar, and I remember my absolute astonishment, it was so far out of my expectation." When receiving her Golden Globe Award last month, Close said on stage: "I'm so honoured to be with my category sisters. And we've gotten to know each other a little bit so far and I can't wait to spend more time with you." But they haven't seen quite as much of each other as they would've liked, Close explains. "Unfortunately we never get to sit together at any of these events! So I guess the person I've gotten to know the most so far is Melissa McCarthy." Indeed, McCarthy was tasked with presenting Close with an honour at the Oscar Wilde Awards, despite the pair being in competition for the real Oscar. But, McCarthy says: "I never think of it that way. I never think that any of us are up against anybody else. "I think it's such a kick to just be a part of this in any way, that I'm just glad I'm here," adds the actress, who was excited to be paying tribute to Close on stage later in the evening. "[Close] said, 'Don't be too nice to me' and I said, 'I won't be!' So we'll see what I can get away with, I'm really going to try to take Close down tonight!"